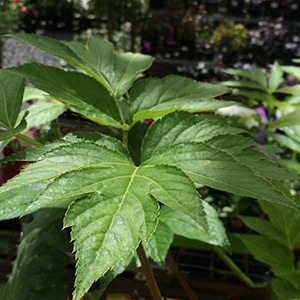 A plant with the common name of ’Tomorrow Leaves’ would seem to promise a few medicinal benefits, Ashitaba has been grown in Japan and China for just this purpose. The botanical name is Angelica keiskei Koidzumi and it has been grown since the 15th Century. The root, stem and the leaves are all used in various traditional medicines. It is the presence of Chalcones in its yellow sap that give this plants its said benefits. Today it is a ’new’ superfood in western culture. It is grown as perennial vegetable as well as for the seed. The leaves can be eaten as a salad, the new shoots can be used, or the plants can be juiced. The common name of “Tomorrow Leaf” comes from the ability of the plant to grow new foliage quickly after a leaf has been picked. Pick a leaf one morning and a new one will replace it by the next morning. Ashitaba is renowned for the amount and the variety of fibre, vitamins, minerals and proteins it contains. It is the antioxidant, chalcone that makes this such a valued plant. It is only found in remote areas of Honshu and the Izu Islands. The choice is to grow Ashitaba from seeds, or to buy small plants. Seed may appear to be cheaper, however they are difficult to germinate. Seed also needs to fresh, and reliable sources of fresh seeds are difficult to find. Young seedlings are not cheap, however they are hardy in the right conditions and will spread. Plants should be spaced at around 40cm apart. Part shade is recommended. It requires a nutrient rich soil to thrive. Seaweed fertiliser, blood and bone and well rotted cow manure can all be mixed into the soil before planting. Although best kept moist, Ashitaba will survive in dryish conditions. Reaches around 1.2 metres in height and is used both as a vegetable and for medicinal purposes. IF you can find fresh seeds, try this method of propagation. Seeds will benefit from being soaked and then given period of stratification in the refrigerator. The seeds should placed in a plastic bag in a peat and sand mixture. They are best planted out in spring, and they need to be surface sown. Keep the seeds moist yet not wet. Provide warmth and some humidity, a heated propagation tray is suitable. Germination should commence in 14 – 21 days. Seeds should be kept in the propagation material for two months before planting into individual pots. Use a free draining potting mix and ensure the containers have good drainage.